Schematic of the nitrogen vacancy center in diamond which can be used for ultra-sensitve measurements. When a ballerina spins a full turn on her toes, she’s back to where she started. But not in quantum physics! Berry phase is an apparently paradoxical phase acquired by a quantum system when taken around a closed path. A real ballerina is too large and complex and classical for the effect to be apparent, so consider instead a quantum ballerina, something simple like a single atom. Spin it a full turn, and measure the phase – for example by interference with a non-rotating quantum ballerina – and it will in general be different. The phase shift can lead to a cancellation in the interference – conceptually, the quantum ballerinas can annihilate and disappear! The Berry phase was discovered in 1956 by Pancharatnam and again in 1984 by Sir Michael Berry. There have been measurements which show that it’s real, but the original pure concept of taking a quantum system around a closed path and measuring the Berry phase has not yet been demonstrated. With Andy Martin and Lloyd Hollenberg and the Quantum Sensing Group (part of the ARC Centre of Quantum Computation & Communication Technology) we are spinning a diamond at up to 500,000 rpm and measuring the Berry phase. Aside from aiming to improve our understanding of quantum physics, the concept may be useful for measuring rotation, for example to develop ultra-sensitive gyroscopes. Why diamond? Diamond often has tiny defects, by accident or by design. 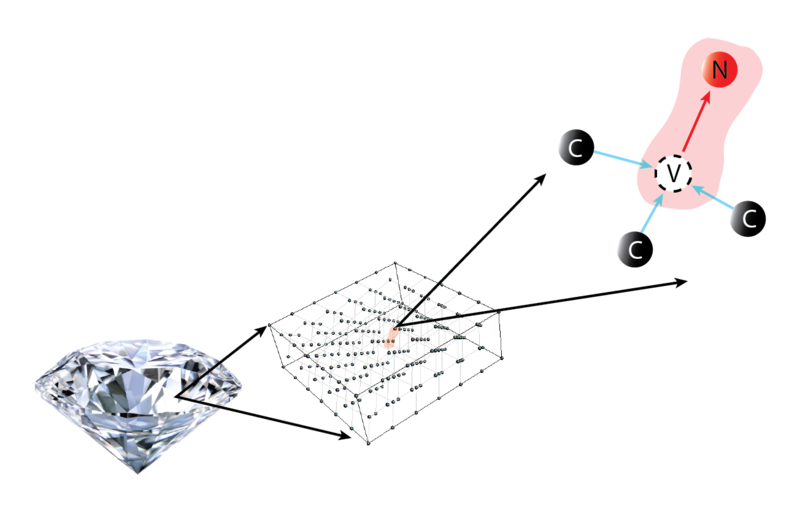 One particular defect is the nitrogen-vacancy (NV) centre, formed from a nitrogen atom adjacent to a missing (vacant) carbon atom in the diamond lattice. The NV centre forms a highly stable quantum system (the quantum ballerina) which is stable at room temperatures over very long times. By very long times, we mean hundreds of microseconds, but that’s long enough to spin our ballerina around a full circle, if we use a very very fast motor (hence, 500,000 rpm). Berry phase is one part of our research on using NV centres for precision sensing of magnetic, electric and strain fields on the nanoscale. Precision sensing and measurement are key to advances in science generally, from testing the laws of physics to measuring dynamics and structure inside living human cancer cells, as described in some of publications below. For more information contact Alex Wood.